"[Barrons' music sounds like] a molecule that has stubbed its toes." — From the Diary of Anais Nin, Volume 7 (1966-1974). 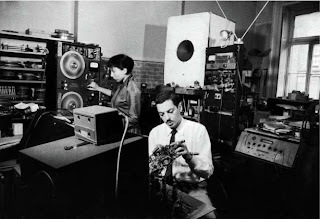 50’s electronica pioneers armed only with soldering irons, analogue circuitry and magnetic tape. Known for their “electronic tonalities” (The Musicians Union didn’t consider their work “music” and deined them membership.) to the classic SF film “Forbidden Planet “.